This cake was made by SIL, a couple of months ago. 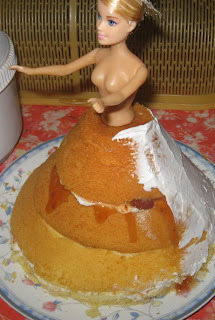 She just happened to make a Barbie doll cake for fun when we were at her house. I have seen many beautifully decorated Barbie dolls cakes before but have no idea how they were made until I seen the making of this one. 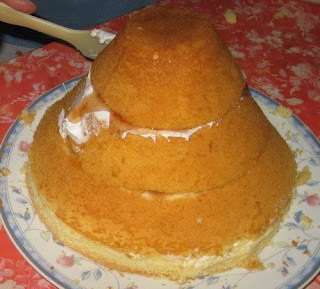 The cake was baked in a cone shape container then slice and fill the layers with cream and jam. Cut off the unwanted edges for smooth application of cream later. 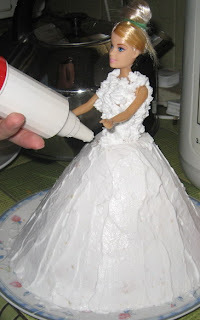 Sorry, I can only show the making of the Barbie doll cake up to this stage as we have to rush back to get ourselves ready for our nephew's wedding dinner party. By the time, we came back for the cake after our dinner party, it has already been cut and partially eaten. 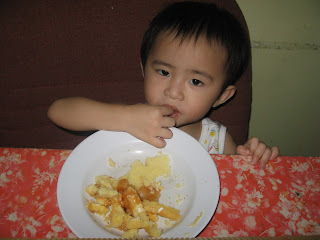 I only managed to tapau some cake home for supper. This is my niece, Aneliese, she was eating the unwanted part of the cakes while the mummy was busy decorating the Barbie doll cake.